By the Godfathers of Psycho-Ska! 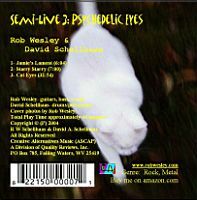 Description: The third in the Semi-Live cd series, the first two tracks are from the spontaneous and unplanned jam-session of January 21, 2001 with Rob Wesley on guitar and David Schellhaas on drums, captured on 4-track tape. 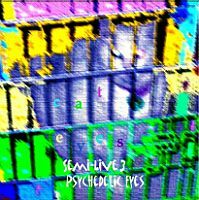 The third track, the monstrously-long and ever-changing Cat Eyes, was captured entirely in the digital studio the night of November 23, 2002. Its style is reminiscent of Rob's 1960's psychedelic-rock guitar playing, with a bit of a hip-hop flair by David on drums. The other two tracks are also of a similar influence.